Proper oral hygiene is still very important when you wear dentures. The best way to keep them clean is by using a brush designed specifically for use with false teeth. They are very different to a regular toothbrush in a number of ways and these differences can have a great deal to do with how your dentures are cared for. A denture brush has a different design to a regular toothbrush. The denture cleaning brush has bristles on both sides of the head. This provides you with two different brush shapes to assist with the cleaning process. The thing to keep in mind here is that denture brushes for false teeth bristles are firm, but not hard. The firmness allows for proper cleaning in and around clips, crevasses and anywhere bacteria can form. A regular toothbrush with hard bristles can damage dentures and may even scratch them. Should You Use A Denture Brush, Or A Normal Toothbrush? It’s best to use a denture brush on dentures because they are specifically designed to clean dentures. False teeth are softer than normal teeth, and are therefore scratched more easily. The bristles are relatively soft, which avoids scratching. 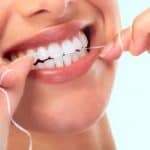 Keeping the surface of your dentures smooth and scratch free is important, as it makes it more difficult for minute food particles, bacteria and stains to attach themselves to the teeth, meaning that they will stay cleaner and whiter for longer (for more tips on whitening your false teeth, click here). 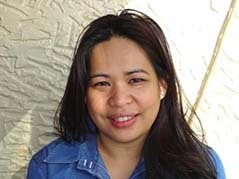 a tapered head that is good for getting into tight areas that are harder to reach. The other advantage is that denture brushes generally have ergonomically designed handles, meaning that they are easier to grip, less tiring to use, and easier to control, which is especially useful for people with limited dexterity. This lightweight brush is recommended by dental professionals and has two different brush heads. One has flat bristles to clean smooth surfaces and the other has a single-tufted head designed for hard to reach locations. The flat side has strong bristles designed to remove plaque, debris and food particles with ease. The tufted side has tapered bristles which allow for cleaning of areas the flat side cannot reach effectively. This denture cleaning brush has an ergonomically designed comfort handle with lever grip. There is also a wide thumb support and solid handgrip for easy, comfortable and precise cleaning. Designed with dual brush heads, this denture cleaning brush is effective in removing food particles on smooth surfaces as well as in crevasses. Made with sturdy all-nylon bristles and a large handle with non-slip grip, this brush is easy to hold and use. 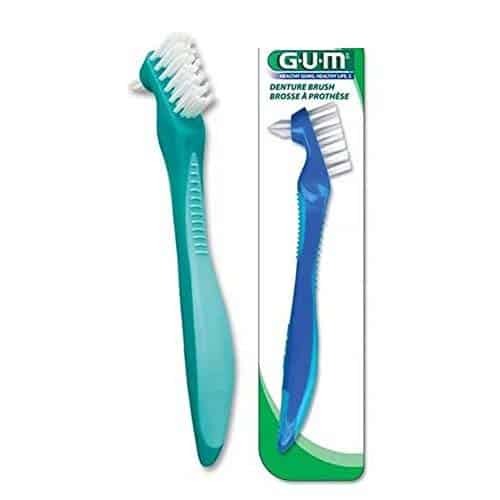 The durable antibacterial plastic material used will eliminate bacterial growth, plus a deep cleaning pick on the handle base provides quick and easy removal of stubborn food particles wedged between teeth or in other hiding places. For more information on the Sea Bond Dental Brush, click here. Designed with a large easy grip handle for comfort, this Oral B denture toothbrush has firm nylon bristles that are strong and effective. It has two brush heads, a large multi-tufted one for cleaning all surfaces and a small angle-trimmed head meant for those hard to reach spots. 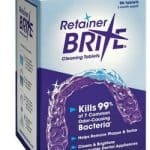 This particular brush is considered by many users to be the best of the toothbrushes for dentures. 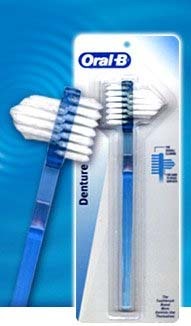 For more information on the Oral B Denture Brush, click here. 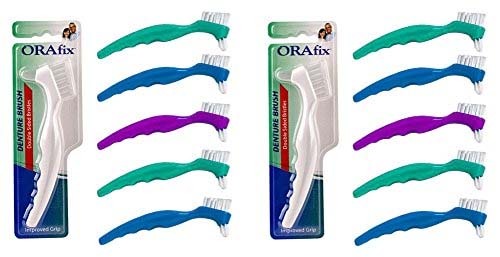 Available in three different colours – green, blue and purple – Archtek has packaged their best-selling denture brushes for false teeth into a 12-pack for ease. These brushes have two heads, one with a flat head and the other with an angled tuft of bristles. The brush also features two types of nylon bristles which will reach and clean all surfaces. The integrated grip is designed for comfort and efficiency. For more information on Archtek Denture Brushes, click here. As you can see, there are several choices available to you when it comes to finding the right brush to clean your false teeth. With special brushes designed just for that task, the final selection is a personal choice depending on what you expect from a cleaning brush and what design you find the most comfortable to use. Once you decide you will want to keep that brush clean and working its best for you. Brush manufacturers know this and have also designed a number of different accessories. 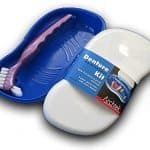 You will want to add a denture brush cover and a denture brush holder to your collection of oral hygiene tools. Once you have all the products necessary for a proper cleaning, you will be able to keep your dentures looking their best. Plus, when they are cleaned daily and cleaned correctly, they will last much longer keeping your smile in the best condition it can be. 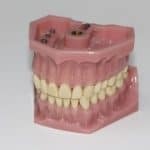 Click here for more information on the different accessories available, including denture brush covers, cases and kits.